This sounds obvious however choosing the workout that best works for you when it comes to building your strength is going to vary from person to person when it comes to specifics. Generally speaking you are going to want to decrease the volume of repetitions you are doing because you want to increase the weight you are lifting per rep. This requires a balance because as you increase the intensity of the exercise, you aren’t going to be able to do as many repetitions. Conversely you want to be steadily progressing in your strength training so you should be adding more repetitions per set as time goes on. Train in lower rep ranges for strength, as opposed to high rep ranges which are designed for endurance. It’s the same idea behind why marathon runners train by doing long distance running and why sprinters are more focused on burst training, the end goal requires a different route in getting there. Keep in mind how your overall strength is measured, by doing one repetition of the most possible weight you can. Lifting at 50% of what you can do for 15-20 repetitions is not going to help you get anywhere when it comes to improving your strength. Many people make the mistake of focusing on secondary complimentary exercises instead of focusing on the more important exercises. People tend to focus on exercises like skull crushers which isolate one muscle group, which can throw off the balance of the joint itself by neglecting the bicep for example. Focus on combination exercises which are going to help you better increase your strength overall in a much faster manner, and will help you keep a better overall balance in your physique. When you are looking to maximize your strength, it is important to keep your energy levels in mind as well. This is why you should always do the exercise that requires the most energy at the beginning of your exercise, and progress from there. This means all exercises that require movement of multiple joints will be performed early on in the routine, followed by isolation exercises. It doesn’t make sense to do dumbbell curls at the beginning of your routine, and ending it with the military press. You will end up fatigued by the end of your workout and you won’t be able to lift as much as you could if you had done the exercise first. No, we don’t mean periodic breaks during exercise, we mean breaking up your strength training routine every so often. A good baseline to go with is 3 weeks on, 1 week off. This will help your body better recover from the strength training, which will help you progress faster in the long run. On you off week you can still exercise, just at both a lower volume and lower intensity. If you are just starting strength training, take it slow on your off week and do only 50-60% maximum of what you normally would do in both repetitions and sets. It is really easy to get used to a routine, start your workout and go in to autopilot mode but to make the most progress you should constantly be switching things up. You don’t have to keep coming up with completely new routines, but making slight modifications to your workout can make all the difference in your results. One easy way to do this is to decrease the volume you were doing in week one, but to increase the intensity. In week 3 you can keep that same high intensity, but start off with a high volume as well. Work your way down as you progress through your routine to where you are doing little volume at the end. The following week you can use as your rest week, and then can repeat again week one. 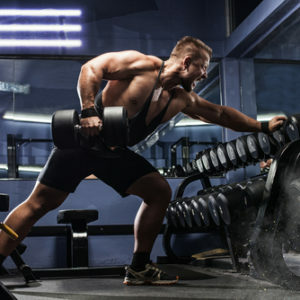 You can continue to make slight modifications to your workout tweaking the intensity, and volume as you go which will help you build and maintain strength as you further progress through your weight training goals. Previous ArticleWhat Should You Do When You Get a Stress Fracture Exercising?